I originally published this in 2011 but thought it would be great to revisit since it still applies today. We’ve all changed the way we live, from the way we communicate, to how we are entertained and gather information. Our shopping and buying behavior, habits and experiences are shifting rapidly. We all acknowledge the world is changing but the new home sales engagement hasn’t kept up. In fact, it’s holding us back. Shifting demographics, globalization and technology are creating a ‘new economy’. This brings us to a time that requires new thinking, attitudes and plans to use technology if we want to effectively engage, connect and convert shoppers to customers. Our greatest challenge in making a successful transition comes from ‘normalcy bias’. Economic, process and sales ‘normalcy bias’ is holding us back from adapting and using technology effectively. It causes people and companies to keep attempting to add technology to their existing process. Technology and our buyer’s behavior have now surpassed us and we must catch up. The first obstacle to overcome in using technology effectively in the sales engagement is an understanding that adding technology to the traditional sales process is a bad idea. This applies to the selling of homes; options and the design center experience, because to the homebuyer they are one in the same. Options or interior design selections are often treated as a nuisance and presented as products and not an integral part of people’s home buying process. Our customers want a finished home, they don’t want a fixer upper. Successful use of technology to convert shoppers to customers requires a shift in the way people; sales environments and technology are combined and utilized to enhance the homebuyers’ journey. This is New Home Retailing and it results in increased sales, homebuyer satisfaction and reduced costs. The buyer and seller relationship is dysfunctional. Buyers don’t trust or believe salespeople. They respond to surveys by saying they believe salespeople care more about the transaction than about helping them. 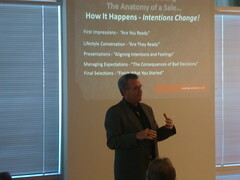 Salespeople’s intention is to make a sale. This is a leadership issue as executives, sales managers and traditional sales training reinforces this intention. This intention causes salespeople to look, act and sound similar…It makes them present to, rather than engage, people. Shift salespeople’s intentions to connect and communicate with homebuyer’s and heal the dysfunctional relationship. Provide a new sales process that aligns with the buyer’s journey. It’s their process not ours. 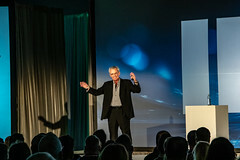 This connects people and allows for an extended conversation, especially when done in a new sales environment and with the use of technology. Traditional sales environments look and feel the same. They support a dying traditional sales process that’s focused on the seller, not the buyer or even the product the buyer cares about. Doesn’t support the use of technology…Makes technology an add-on, intruder and distraction to the old traditional process. Redesign the selling space around the buyer’s journey. The internet is a place, not media, engage and interact online as an extension of your physical selling environment. Stop adding technology to an old process and environment. Meet buyers where they want help, to enhance the personal connection and use of technology to extend the conversation and help home shoppers take their next step. No fences…No sales office…Take advantage of technology, mobility and deepen the emotional connection. Meet them in the models, interact with visualization tools and make the buying experience informative, entertaining and an extension of their online beginning. Increase buyer participation, interaction and conversation with technology. Create the real possibility of selling all your communities from anywhere, anytime. Most builders have tried adding technology to their existing sales process, not using technology to create and enhance a new sales engagement. Technology added to the old traditional sales process and sales environments makes it expensive ‘digital art’. Technology is ineffective as an add-on. In fact, it becomes a distraction or interruption to the traditional sales process. In this format it’s ROI is weak at best or more often just an added cost.ld traditional sales process and sales environments makes it expensive ‘digital art’. It’s ineffective as an add-on. Replace your existing traditional sales process with new intentions, environments and the use of technology. Engage, involve and connect with homebuyers in an interactive experience making the salesperson the buyers guide, on their homeownership journey. Separate yourself from your competition for now… Allow your homes and the lifestyle they provide to become the destination of this journey. Include technology engagement throughout the home tour in kiosk, tablets, flat screens and surfaces. 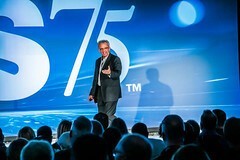 Connect online experience to the onsite experience, extending the engagement. Allow the journey to continue. Using catalogs, visualization, animation, video and emerging new technologies to create a rich, emotion and visual experience…Last but not least, using live video and audio of the buyer and seller engagement to improve the engagement is long overdue if you truly want to improve the home buying experience. Replace mediocre salespeople and the dying sales process with an interactive engagement that costs less and produces the same or more results. This solution will always leave you vulnerable to companies who chose to do the first alternate solution. With today’s broken, dysfunctional and dying sales process, what do you have to lose? Anything different will be the first step toward an improved sales engagement and result in converting more home shoppers to satisfied homeowners. The use of technology is inevitable and has already begun. It will be most effective in a new sales environment but not fully effective until people are engaged by salespeople with aligned intentions. When all three are combined the ROI of technology is multiplied exponentially. Make People, the sales Environment and the use of Technology your P.E.T. Project! Combining these three elements in the engagement of people shopping for new homes is the best way to stand out in a crowded marketplace. It will enable your salespeople to connect with buyers to help them take the next steps in owning your homes.